Vada's Blog Stamp Inks and Paper : Sanded Core’dinations from April 2010 Newsletter. 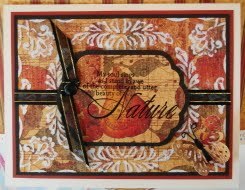 This beautiful paper is from Graphic 45 the Botanicabella Collection. As you can see it lends well to this technique. Stamp used is from IBFS. Spellbinders Die and Punch from Martha Stewart.